A connection fee applies to all calls to mobiles and landlines made using Skype Credit, where the call is answered and lasts longer than one second. The connection fee is charged according to the currency set in your account. 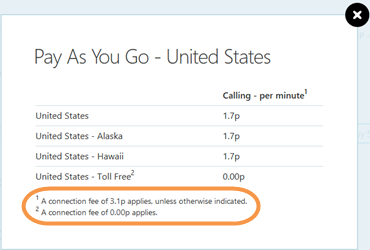 In the Skype rates webpage, select the country you want call to. This displays all the possible calling rates. Click the View all PAYG calling rates. A pop-up window displaying the calling rates and the connection fee information opens. Calls made as part of an unlimited* calling subscription are exempt from the connection fee, and of course, Skype-to-Skype calls are completely free. *A fair usage policy applies to unlimited subscriptions.